Want to start your email marketing campaigns? Have something to sell, a cause to promote, a service to provide? Whether you're looking to send an email newsletter, a high-impact email promotion, an email event invitation, an online survey, or build your email list, discover how Digeus Jet Email Extractor can help you get it done. 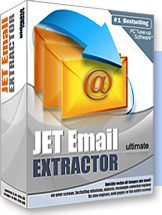 Digeus Jet Email Extractor is a great helper in conducting email marketing campaigns. Every email campaign requires large lists of email addresses. It's almost impossible to extract the email addresses manually. It was designed to collect targeted email addresses of potential customers to boost your sales and revenue. Digeus Jet Email Extractor will build huge targeted mailing lists. It connects to lots of news servers and retrieves email addresses from the headers of each and every article in chosen target-related newsgroups. 1. Run Jet Email Extractor and select news groups related to your target audience. 3. Save strongly targeted users` emails with names to text file for your email campaign. Capture email addresses at very high speed. Multithreaded. Average speed is 100,000 emails per hour! Discover how easy it is to create your email list!